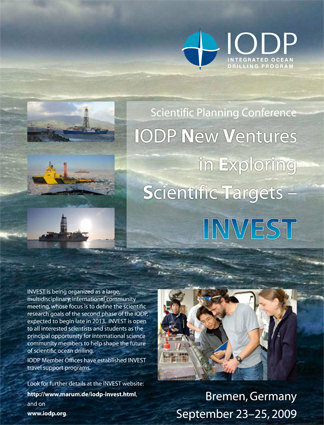 Close to 600 scientists from 21 countries met at the INVEST (IODP New Ventures in Exploring Scientific Targets) conference in Bremen, Germany September 23-25, 2009 to define the scientific research goals for a new and ambitious ocean drilling research program, which is expected to begin in 2013, after the current Integrated Ocean Drilling Program (IODP) concludes. The outcome of the Bremen meeting will result in a new science plan, enabling scientific ocean drilling to take on a central role in environmental understanding and stewardship of our planet in the 21st century. The U.S. Science Support program provided travel support for the U.S. participants attending the meeting.